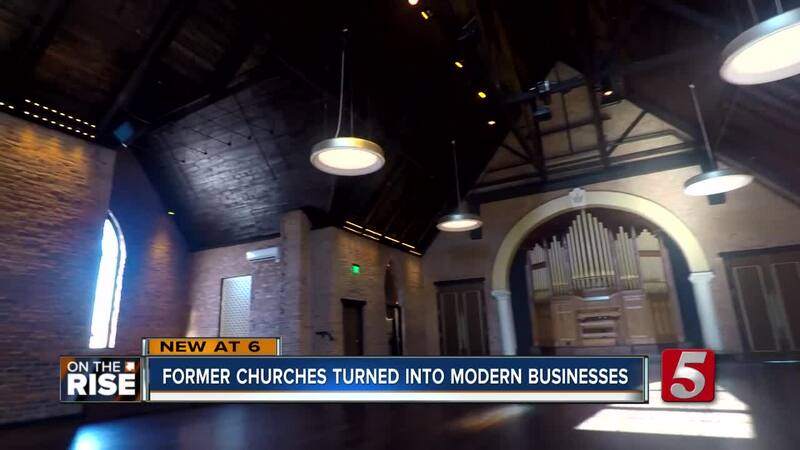 Nashville is seeing a trend where old churches are being refurbished and turned into modern businesses. NASHVILLE, Tenn. (WTVF) — In a city on the rise, sometimes history can be lost in the mad dash of development. However, several old churches are being saved by people who want to preserve them for a new purpose. Flamingo Cocktail Club , Snapshot Interactive , Grimey's New and Pre-Loved Music , and Clementine Hall are all businesses that now operate out of former churches. Brenda Cook said, "I think it's really important to keep Nashville unique." Clementine is a wedding and event venue that opened over the summer after Cook and her husband refurbished the 130-year-old church. Cook said, "Just keeping that history alive in the space was what's important to us, and I think that appeals to a lot of people when they come in here." From West to East Nashville, old churches are being saved. Doyle Davis said, "I'd rather see that than them torn down and turned into more faceless gentrification." Davis co-owns Grimey's, a well known record shop in the music industry. Davis said, "I feel like this place has some vibes in spades, and it's just absolutely gorgeous." The sound of hymns once echoed against the church's walls during worship service. Davis said, "And you know the Ryman is known as the 'mother church,' it's a big iconic music venue, so we've been thinking of ourselves as the 'other church' lately." These former places of worship could have faced demolition in a booming city like Nashville. Davis said, "One of the people from the church when we over here moving in one day told me they were so excited that we were coming in because we were going to continue to bring music into this space and we were really excited about that." When some people saw rotted wood, others saw a vision for renewal. Now, several pieces of Nashville's history have been saved for the time being.